VAttendance - Cloud Grade Security and Scalability, Easy Adoption, Seamless Integration and a powerful Dashboard, it doesn't get any better! Accurate, Secure and always online. Cloud grade scalable, 100% uptime guarantee. Full Integration with LMS and Industry Leading ERP’s/SIM’s. registers, manual roll calls and proxy attendance are all things of the past! VAttendance harnesses the power of cloud & the convenience of mobile application to deliver a complete paradigm shift in the way you maintain your student’s records. 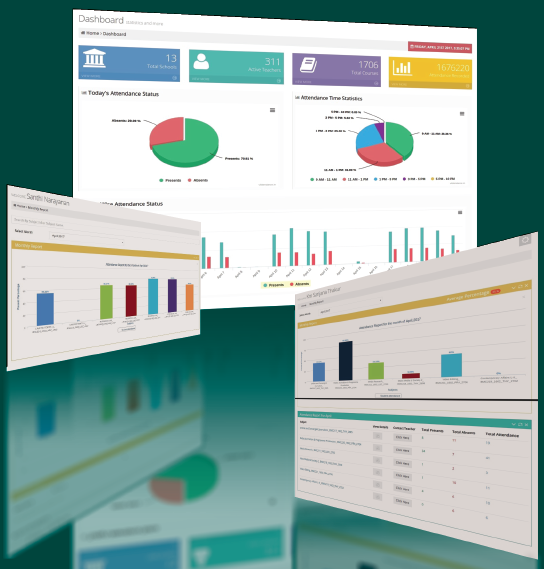 VAttendance comes with a feature packed web dashboard with multi-role access and deep customization options. Our rule-based notification engine and seamless integration with your LMS/ERP ensures you are up and running quick. The best part is, it REALLY works! VAttendance is powered by the Amazon Web Services (AWS) platform. When it comes to security and scalability of your records, we mean business! VAttendance delivers a true anytime, anywhere environment by ensuring you have access to your data all the time. And just like cloud, we’re there 24×7 for you. Choose between Manual or Automatic mode to record attendance. Get instantly notified about your attendance. You can also opt for SMS or Email updates. VAttendance fully supports offline mode. Network or not, you’re on! VAttendance provides separate app for Faculty and Students, providing easy access to your records. Each build of the app is Tailor Made for your Organization. A great interface which is easy to use and designed for 100% adoption. Get deep insights into attendance patterns across schools, departments & locations. With predictive analytics, we take your visibility to the next level! We understand that you may want your reports to be personalized. With VAttendance, we ensure we generate reports just as you want them. VAttendance provides support for a variety of roles including Admin, Faculty, Student, Parent and Academic Coordinators. Custom roles? No problem! Our agile architecture allows us to rapidly adapt to your organization hierarchy and processes. We seamlessly integrate and deliver value, quick! VAttendance was deployed and was adopted very quickly. We didn’t need any new hardware and the system was live even before we could throw out our attendance registers! Special praise for the team @VAttendance for the incredible onboarding support. The benefits that VAttendance provides cost way less than it gives back. It is the most profitable investment you will make, and we cannot possibly imagine going back to old pen and paper model.